The Fargo DTC1250e Single-Sided ID Card System is designed to not take up too much space to fit in anywhere in your office environment. It’s easy to make custom ID badges on the spot thanks to the included Swift ID badging software. You can even upgrade the Fargo DTC1250e Single-Sided ID Card System with the iCLASS SE encoder, letting you print secure, personalized photo IDs in a single, easy step. 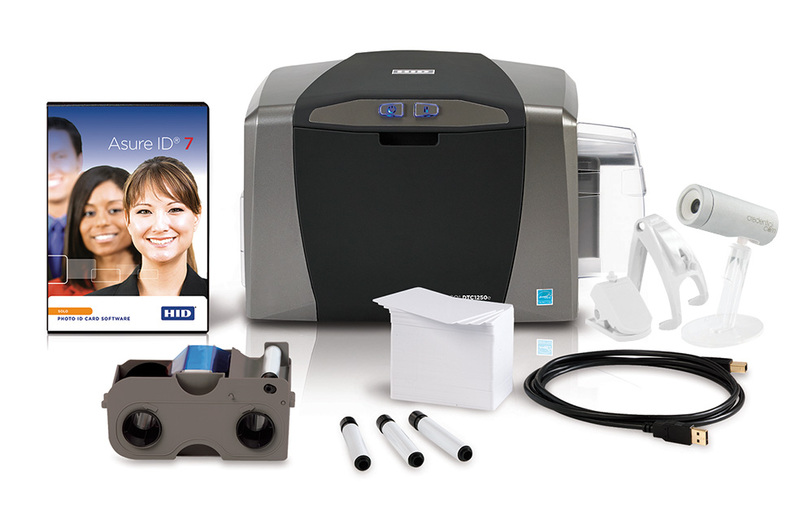 The Fargo DTC1250e ID Card Printer comes with a built-in Swift ID badge application that easy for anyone to create vivid color credentials in seconds. No more need to install software or send your ID cards out to a third party to print. The optional embedded iCLASS SE encoder in the Fargo DTC1250e ID Card Printer lets you personalize and encode ID cards on the same printer and in the same process. You can encode cards with unique company or employee information and program them to work with a variety of access control systems. The Fargo DTC1250e ID Card Printer comes with the Fargo workbench diagnostic utility software that helps you monitor and maintain your printer over time. There’s even an intuitive, user-friendly SmartScreen graphical display that makes it easy to set up, operate, and maintain your Fargo DTC1250e ID Card Printer. Options include easy-to-use ribbon with disposable ribbon cartridge (EZ) and more economical and eco-friendly refill ribbon for refill cartridge (ECO).